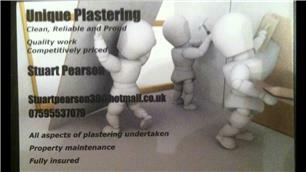 Unique Plastering - Plasterer based in Waterlooville, Hampshire. 1) being clean, plastering is horrible if you need to have it done but I make sure it's as clean when I leave as it is when I come in, down to simple things like cleaning windows and wood work. 2) Be reliable, it speaks for itself when you turn up when you say you will. 3) Pride, there's nothing more satisfying than leaving a job knowing it’s the best it can be. I take lots of pride in my work so people comment how good it looks, it puts a smile on my face. I take on any size job from small ceilings or walls to whole houses, plastering, dry lining, K rend, sand and cement render, float and set, floor screeds and more. I also do property maintenance and am able to contract work meaning if you need other trades I can source them, and work around them to complete the job as efficiently as possible to a high standard. We can now also install Venician plaster and micro cement to floors walls and ceilings, ideal for bathrooms and kitchens or for simply just a feature wall in a room. Emsworth, Southampton, Gosport, Portsmouth, Waterlooville, Southsea, Petersfield.